The top White Sox prospect was optioned back to Triple-A from big league camp on March 12, but he won't stick in Charlotte for long. The 22-year-old has already proven that he can punish Intentional League pitching, posting a .355/.399/.597 slash line with 12 dingers, 13 doubles and 33 RBIs over the final 55 games of the 2018 season. Although Jimenez experienced a dip in those numbers during Spring Training, finishing 4-for-26 with a home run in nine games, there is no doubt within the organization that he will hit at the next level. The focus for the 6-foot-4, 205-pound outfielder will be rounding out the other facets of his game before he gets the call to The Show. "He positioned himself really well on the offensive front. He's hitting to all fields and with power. But for him now it's about becoming the complete player he wants to be, and that we expect him to be," White Sox director of player development Chris Getz said. "Defense, baserunning, preparation -- all those types of things, all coming together for him. Especially with the defense, once he's making proper routes and reads on balls, those will be the finishing touches to him being the player we think he can be." The third-ranked White Sox prospect was the other big chip in the 2017 trade with the Cubs for Jose Quintana, and he could prove vital for the organization's rebuild. Cease thrust himself onto the radar last season after being promoted to Double-A Birmingham, posting a 1.72 ERA and 0.99 WHIP. He went unbeaten over 10 starts (52 1/3 IP) in the Southern League and whiffed 78 while compiling a 24-inning scoreless steak that spanned into his eighth Double-A appearance. MLB.com's No. 21 overall prospect placed fifth in the Minors in opponent average (.189). The 23-year-old also appeared in the Futures Game in Washington D.C. This spring, Cease tossed 6 1/3 scoreless frames over three appearances in the Cactus League. "Dylan just needs to continue to do what he was doing last season. He's got four plus pitches, and he can throw them all for strikes," Getz said. "Now it's about being able to locate in all quadrants. But his pitches have great spin rate, and we like where he's at physically and from a maturity standpoint. We wanted a season's worth of innings last year, and he went beyond expectations there. We're confident he's gonna have another great season, and we'll see where he finishes." Selected fourth overall by Chicago in last year's Draft, Madrigal did not disappoint in his first professional season as he worked his was through three levels of the White Sox system. The organization's fifth-ranked prospect opened in the Arizona League but only lasted five games before being called up to Class A Kannapolis. With the Intimidators, the 22-year-old hit .341/.347/.409 with three doubles and six RBIs in 12 games. On Aug. 2 he was promoted to Class A Advanced Winston-Salem, posting a .306/.355/.347 slash line in 26 contests. Those numbers came as little surprise, given the fact that Madrigal possesses a 65 hit grade on the 20-80 scouting scale. However, the former Pac-12 Conference Player of the Year out of Oregon State is also an elite defender. Madrigal committed a single error across all three levels in his first professional season (175 total chances) and was named to MLB.com's 2019 All-Defense Team. The Sacramento native was a non-roster invitee to big league camp this year and hit .333/.412/.333 with a pair of walks in nine games. He also committed one error in 17 total chances at second base. "Nick made a great impression at Major League camp and is playing well here at Minor League camp as well," Getz said. "It's well documented what he can do. He puts together quality at-bats, he makes the plays defensively -- he's just a heady player. "Right now he just has to get acclimated to pro seasons. Certainly there is that adjustment period. But he's a guy that can square up a lot of pitches, and once he gets a better understanding of himself and different situations -- pitches and counts to drive the baseball -- he's going to become the impact offensive player we think he can be." Hamilton got his first taste of the bigs last year, and the main reason was his fastball. The No. 14 White Sox prospect's heater grades at 70 on the 20-80 scouting scale and has gone from average to elite since becoming a professional hurler. The 2016 11th-rounder was drafted as a starter, and his fastball at the time was clocked in the low-90s with minimal life. However, the 23-year-old turned that pitch into a dominant weapon after transitioning into a bullpen role. His heater now consistently attacks hitters in the mid-to-high 90s and has touched triple digits while showing late sink. In his second full professional season last year, Hamilton limited opponents to a .204 average between Double-A and Triple-A and fanned 62 over 51 2/3 total frames out of the 'pen. After getting called up to The Show, the Washington State product made 10 appearances and whiffed five over eight innings. "He really put together a tremendous year last year," Getz said. "He showed improved velocity and good ride on his fastball, and he also showed a really good slider. He's got the mentality of a bulldog when he's out there. He's a guy that certainly can be a really effective back-end-of-the-bullpen type, and that's what we hope to continue to see from him going forward." After the White Sox took Madrigal No. 4 overall last year, the organization drafted Walker with their next pick -- No. 46 overall. The 22-year-old opened his first professional season in the Rookie-level Arizona League but only lasted four games before being promoted to Rookie Advanced Great Falls. Walker's smooth stroke was on display as he went 7-for-34 with a pair of dingers for the Voyagers over nine games, and on Aug. 2 he was called up to Class A Kannapolis, where the Oklahoma product broke out. The 11th-ranked White Sox prospect put together a three-hit, five-RBI night for the Intimidators on Aug. 25 and finished the season with 21 hits and 17 RBIs over 31 games in the South Atlantic League. Although there are questions surrounding aspects of Walker's game outside of his hitting, the White Sox believe with his first professional season under his belt and the right instruction going forward that Walker can become an outstanding complete player. "He had a bit of a layoff toward the end of his college season, and he had some bumps and bruises last year. But we think once he gets consistent at-bats he's going to be very productive for us," Getz said. "He's a strong kid that plays with a lot of energy. His swing is very sound. He's a great competitor with plenty of tools to impact the game in a lot of ways." More to keep an eye on: No. 13 prospect Jake Burger will not open the season on an active roster after missing all of 2018 with a ruptured Achilles tendon and then retearing it last May; however, he is expected to return to action at some point this season and make an impact. 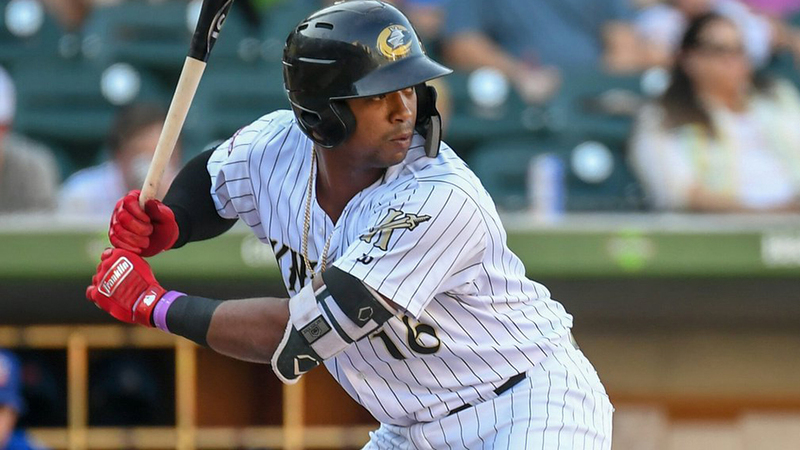 ... Outfielders Micker Adolfo and Luis Alexander Basabe both saw time in big league camp and will start the season at Double-A Birmingham but could be on the move again quickly. ... Blake Rutherford and Zack Collins should continue to make strides with a clean bill of health and could be knocking on the door of The Show by the end of the year.